This entry was posted in Environment, Travel by Adam. Bookmark the permalink. 1. Normal winter low flow. 2. Water hogging by upstream factories and municipalities. 3. North South water diversion is……..diverting water successfully. 4. Less precipitation and/or glacial contributions are lessening as the glaciers shrink. Most of the rainfall goes to the Bei Jiang river comes from the South China sea whereas water from the south-north water diversion project comes from the Himalayas. When I lived in Shenzhen we were fortunate we never had to deal with water rationaing. It was something I was very concerned about, of course. 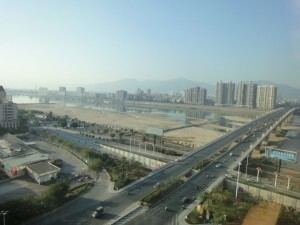 When I looked into where South China water really went, I was surprised. Before I lived in that area, I would have thought that precious water was diverted to support the myriad of manufacturing plants that have taken over the region. I would have guessed that Hong Kong also got their water from the Mainland, but I never would have guessed how much. Fully 80% of HK’s water comes from Mainland China sources, as it has for many, many years. Last year HK finalized a new supply contract from the Dongjiang, guarenteeing a “a stable yet flexible supply of Dongjiang water up to 2011 based on the actual needs of Hong Kong. This will cater for Hong Kong’s needs even under extreme drought conditions…” In fact, it looks to me (correct me if I am wrong) that Hong Kong even gets preferred right to Dongjiang water as their agreement means that Dongjiang could meet up to 80% of the total (growing) water needs of Hong Kong. The supply from the Mainland is guarenteed! Of course, all this in on the SZ/HK side of the Pearl River. For the Zhuhai/Macau side, today’s SCMP reported that Zhuhai is on emergency water rationing, and Macau is being urged to ration as well, though this is not binding. Between the drought and the rising sea levels (bringing more salt water up the Pearl River Delta) the Beijiang and Xijiang are as you picture it above, in big trouble. Earlier this year water supply to Macau from Beijiang was guarenteed despite persitant drought, though how much longer will that be possible, I wonder.